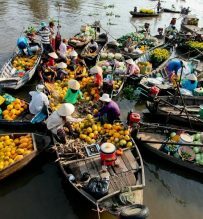 2 day tour from Ho Chi Minh to Mekong delta region, traveling downstream of the rivers to see Cai Be floating market, a unique destination of the Mekong river waterways, spending the night with the local host (homestay). Listen to the folk songs and performance by the local artists of Mekong region. Morning pick up at hotel in HCMC and drive ahead to My Tho in upper Mekong Delta region. 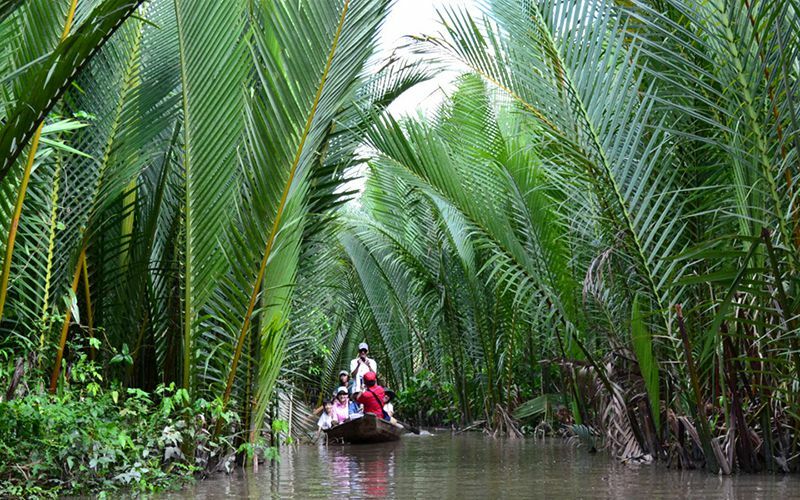 Get on a small boat and then start sailing around beautiful islets of Mekong waterway. 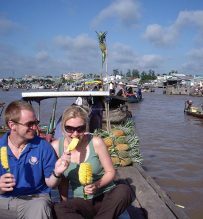 Disembark to visit Mekong traditional houses at Quoi An village (make all from coconut tree). See coconut collection set and how the local make handicrafts from coconut trunk and shell. Visit a coconut candy workshop, taste candy. Take the horse-cart on village path and stop at Ben Truc orchard, taste honey with tea or wine, enjoy seasonal fruits and listening to traditional music. 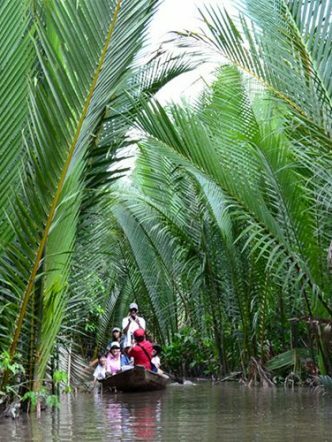 An adventurous sampan ride in palm shading creeks will be the next experience of the riverside region. Lunch to be served with the Mekong Delta specialty. 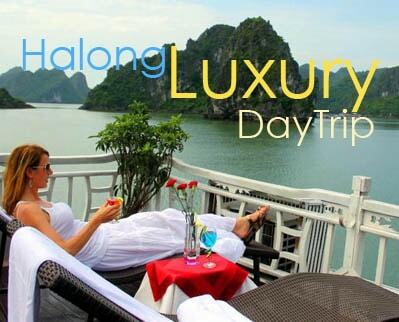 After lunch, continue the drive to Vinh Long, check-in homestay on an island. Afternoon, hop on a bike and ride along the village. 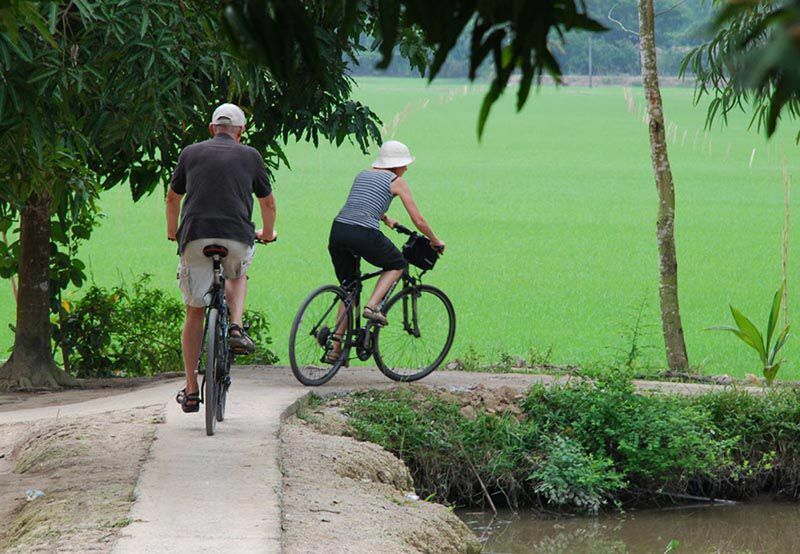 It will be so amazing to bike on village paths to see the local farms, houses, real life and the ancestral ways to pick up fruits in Mekong Delta region. Cooking some dishes with the host. We enjoy dinner and have cup of tea or rice wine when talking together. You can ask the local about the culture, people, history of this Island. They do not mind to answer some personal questions. Overnight at homestay in private room. Enjoy a relaxing morning with home breakfast. 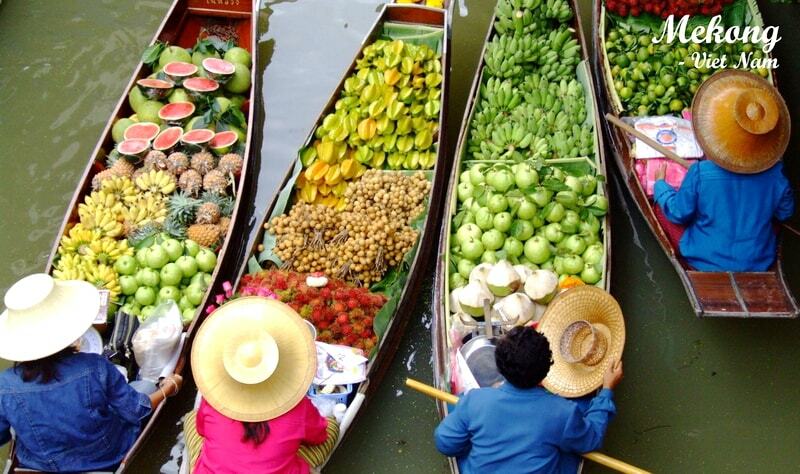 Transfer to a local boat to visit coloring Cai Be floating market. Then, an optional stop can be made at local workshops where you can see how rices paste, coconut candy and pop-rice, pop-corn are made. 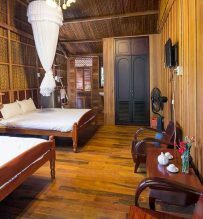 Our boat will take you deeper into the countryside on smaller canals and to enjoy the peaceful time before heading to Vinh Long town, visit the local market. Have lunch at a local restaurant and drive back to Ho Chi Minh City. 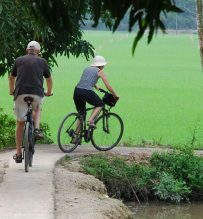 Home Stay: Farm stay is typical home stay in Vinh Long in particular and Mekong Delta in general. 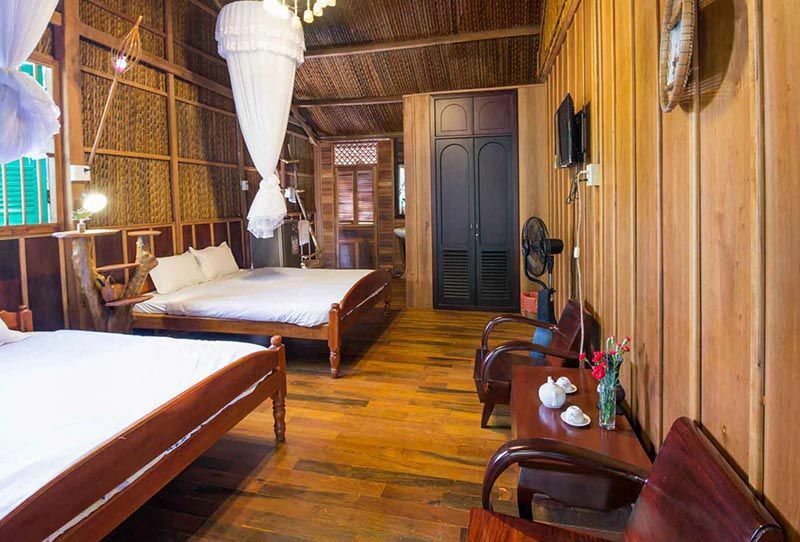 It offers the close up experience of locals better than the well equipped hotels or resorts. You can interact with locals and join the daily activities. 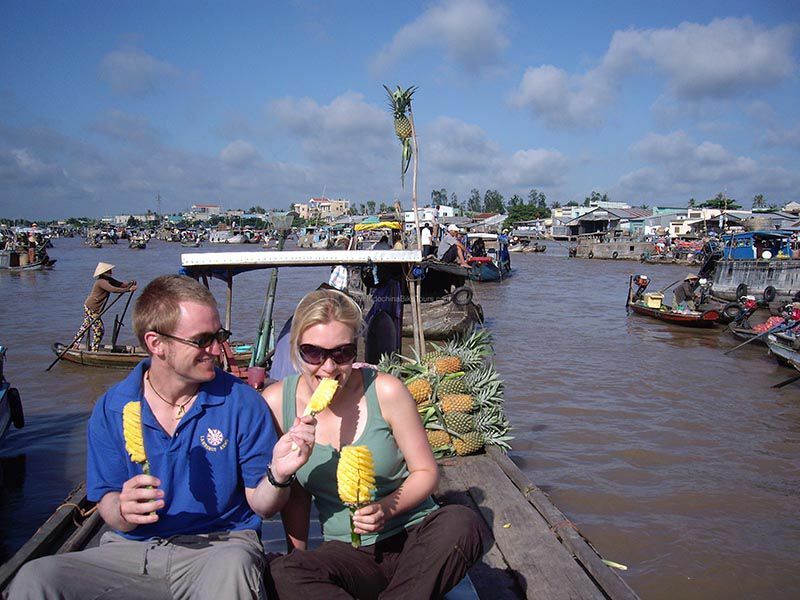 Homestay Mekong Delta 2 days 1 night tour in private group. Private boat trip as specified in the program. Entrance & sightseeing fees for all visits as mentioned in the program. Drinks, other meals and personal expenses.